I was intrigued by this turn of the century (20th century) tale of a young mother of a blind child. It covered a subject about which I knew nothing. I thank the author for sending me a copy of Compromise with Sin at no charge for review. She stops at nothing to maintain a veneer of Victorian respectability. But the consequences of infidelity prove far worse than mere exposure. After straying into the arms of Doc Foster and becoming pregnant, small-town civic leader Louise Morrissey faces ruin if anyone─especially her husband─finds out. To safeguard her marriage and reputation, she weaves a web of deceit which unfortunately ensnares her husband and daughter with tragic consequences. A fictional version of real events, the story pits Louise, Helen, and others against society’s taboos as they champion what would become one of the greatest public health triumphs of the twentieth century. And the story is one of romantic love at its most complicated, tragic, and poignant. 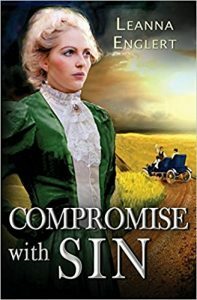 Compromise With Sin is my first novel. Writing it meant I had to re-tool to get away from the journalistic style I’d been accustomed to as a freelance writer in fields as varied as healthcare and manufacturing. Causes on behalf of preventing blindness and serving blind people have been a lifelong interest. I live with my husband, Timothy, in Austin, Texas, where we both volunteer as narrators for the Texas Talking Book Program. When not writing, I inline skate, make polymer clay jewelry, and enjoy time with family. I have to admit that if I were walking through a book store I probably would not have picked up this book to read; the title implies something the book is not. At least to me the titles sounds rather like a romance novel and while there are romantic elements it really is so much more. Louise is a very proper woman married to a somewhat flighty man. He is well known in town and respected in spite of his idiosyncrasies. The two of them run an inn but all is not peaches and cream in their marriage. Louise has an affair with the town doctor and she finds herself pregnant. She believes that her future is assured but as is often the case, life does not follow along with the dreams we have for it. I did not know anything at all about this condition that blinded so many children at this period in history. Not just in the United States, but all over the world. Untreated venereal disease was apparently somewhat rampant and children suffered. Babies’ sore eyes was a condition that happened when the infection got into the babies’ eyes when passing through the birth canal. It was determined that if the babies were given eye drops immediately after birth there would be no instances of blindness from this cause. Books that educate me are always a good thing and this book has sent me down a googling rabbit hole. Scary times, back then. It was also the Victorian era when repressed didn’t begin to describe how people were about sexual issues. But that is another issue altogether. Back to the book: despite the topic I did enjoy it. The characters were diverse and for the most part well developed. There were also a variety of other issues introduced into the story including Indian and immigrant relations and the differences between city folk and country folk. The book title as I noted, does not mean what it necessarily implies so look past it to an engrossing story about a woman working with an American icon to help many children at a time when it was not popular to do so. ALL PURCHASE LINKS ARE AFFILIATE LINKS WHICH MEANS IF YOU BUY ANYTHING THROUGH THEM I WILL RECEIVE A SMALL COMMISSION (AT NO ADDITIONAL CHARGE TO YOU) THAT HELPS TO KEEP THE FARM CATS IN TOYS AND TREATS.